The California Highway Patrol was able to gather multiple dogs after a police chase on the 710 Freeway on Monday, Jan. 18, 2016. LONG BEACH, Calif. -- A police chase came to a sudden end, but a new one began as officers attempted to corral dogs that were loose on the 710 Freeway Monday evening. The California Highway Patrol said it approached a vehicle parked on the right shoulder of the westbound 91 Freeway near Atlantic Avenue at about 9:25 p.m. When troopers walked toward the vehicle, they said the car took off. The CHP said speeds remained low, between 25 to 35 mph during the chase. The chase came to an end on the southbound 710 Freeway near Pacific Coast Highway in Long Beach when officers performed a PIT maneuver, disabling her vehicle. The female driver eventually got out of the vehicle and surrendered to police, but as she did six dogs jumped out of the car and onto the freeway. 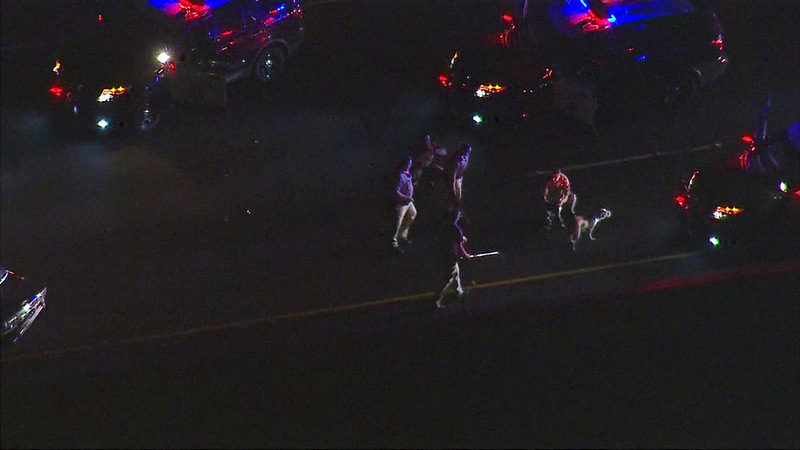 Officers took several minutes attempting to gather the dogs as traffic continued to back up down the freeway. Police confirm all six dogs were safely gathered and placed in the custody of animal control. The 710 Freeway reopened shortly after the dogs were collected.